Giving your employees the tools to do the job. At RWA, we believe that the best way to motivate your employees is to give them the tools to learn new skills, the freedom to put their creative ideas into practice and to encourage them to take ownership of their personal development. RWA Training delivers face-to-face training and learning solutions to companies of all shapes and sizes. Whether you are looking for technical training to improve competence, or professional skills and leadership training to help you get the most out of your business, RWA Training is here to help. Our approach is not to simply deliver off the shelf training courses. We will work with you to establish knowledge gaps and identify training needs before putting together the courses and resources needed to maximise the benefit for your business. 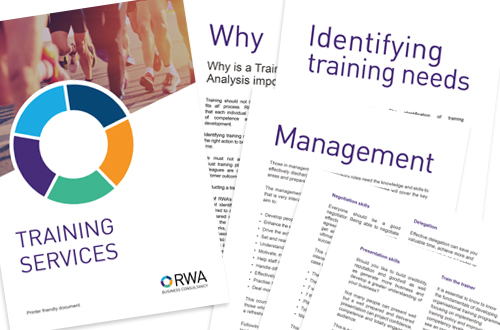 For further information on RWA Training and how it can support your business, download our brochure and submit an enquiry today. How can RWA help you?